In the summer of 2005 I was lucky enough to put up what I think is the first real rock climbing route in the Caroline islands...if not Micronesia. During the school years 1998-1999 and 2000-2001 I served as a volunteer teacher at Pohnpei SDA School, Pohnpei, Federated States of Micronesia (near Guam). Some of my friends think I'm a little crazy when I climb. If there's something to be climbed (ie building, tree, rock, antenna, rock, hill, rock, mountain, rock, etc.) then you can expect to see me trying to climb it. 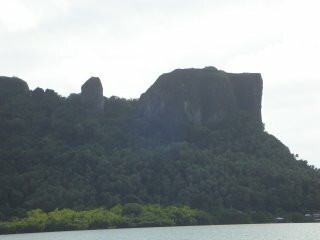 This was the case from the first time I saw Sokehs Rock (Paipalap) as I first landed on Pohnpei in 1998. As you fly into Pohnpei airport, the rock is impossible to miss. It rises over 600 feet from the ocean to its flat top. 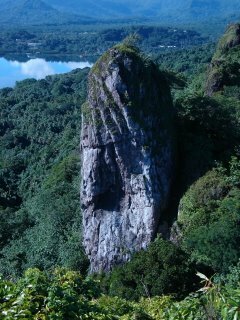 The rock face is about 350 feet tall, and gives way to steep, dense jungle at the base. Many tourists take the treck to the top of the rock. It is not a hard scramble, and is aided by rope, roots, and pipe. The latter is used to power a warning light atop the football-sized tabletop of the main rock. When climbing this in 2001, a friend and I hit upon the idea of climbing the spire directly behind the main rock. We succeeded in scrambling up the backside of this spire, and were rewarded with a unique view of the main rock and Sokehs mountain (Pohndolap) behind. As I planned my return visit for a graduation in 2002, I packed enough rope to rappell the main face of the main rock. I was aided in doing this by several of the teachers there that year. The rappell was scary, as I had to pass knots on the way down. When I reached the jungle below, I found it so dense and steep that I had to roll down through the foilage. This was a PAIN! I had fun, and also realized that this main face was way too challenging for my skill level. Last year I focused on the spire climbed in 2001. I was sure that I could set a toproped climb on it. I had hoped to then climb the climb on toprope, setting bolts or using trad gear to protect the climb. I had estimated that the rock was 150 feet tall. I brought along a friend to belay me on the climb up the backside, which was a very smart thing to do, as you will hear later. I succeeded in setting 2 bolts and chains at the top of the route. I set my anchor, then set out to rappell the route. I found that the route was 165 feet in length, and that I barely made it to the bottom using my two ropes (60m and 50m ropes). I then set out to climb the route. Well, with 165 feet of rope and a slant in the rock at the top, there was A LOT of rope friction. I only succeeded in climbing the first 90 feet of the route. At this time, I needed to make some improvements to the anchors, so with my friend belaying, I again began to climb up the backside. This 5.7 or 5.8 climb when dry is IMPOSSIBLE to safely climb in wet. This I discovered on a couple of occasions when I slipped and fell 30+ feet. My belayer and a prominent tree saved me from a rough landing! Thanks Jon! My advice to anyone who would like to climb this route is BE CAREFUL! I hope to return and finish the climb, hopefully bolting the entire route. The problem is that basalt is VERY DENSE and each bolt took 1.5 hours to put in! I need to buy a drill! If you are on the island and looking for a challenge, check it out! Vist http://www.pohnpeiheaven.com/paipalap.htm to see other pictures and a great description of the climb. So I happened upon your blogspot and noticed that in your list of interests you have 'picking'. Ummm, what exactly do you enjoy picking? Flowers, your guitar, your nose? p.s. i'm jealous of all your climbing opportunities!